Jazzy now known as Tullulah | One Dog More! 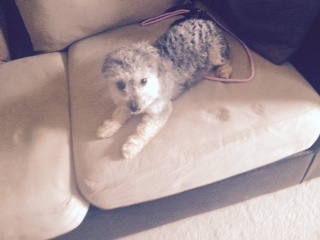 Jazzy is a 2 year old female Poodle mix. She will be up to date on shots, microchipped, spayed and HW tested before adoption. She is mostly housebroke with a few accidents but that could just be from the stress of losing her home. Jazzy was an owner surrender. They didn’t have time for her. Jazzy does walk well on a leash and is good with other dogs, cats and kids.